It’s 85 degrees in Los Angeles, the air thick with the chance of rain. I’ve been wandering through Zenshuji Soto Mission in Little Tokyo, searching for Fumi Akutagawa and her weekly tea ceremony class. In the basement rec room, toddlers play on the carpet. In the second-floor offices, stacks of envelopes lean precariously over. Through a doorway, I glimpse the hondo, where rows of wooden pews sit before gilded statues of Bodhisattvas in the dark. I know I’ve found the right room, finally, when I see a row of geta outside a door. Akutagawa Sensei and her sister Yaeko Hosobuchi (also a tea ceremony instructor) are adjusting a student’s obi. “Go take a look,” says Akutagawa. Lynn Scriven walks to the full-length mirror in the corner and smiles at the reflection of her blue fabric. All three women are wearing gauzy summer kimono, light enough that their white cotton under-kimono peek through the weave. In these hot summer months, every part of the ceremony is adjusted for the season. The chawan are shallow, in order to let air circulate across a wider surface area, cooling the tea faster. Instead of a clay pot, a crystal mizusashi holds the water, which is iced. “Not everyone does it this way,” says Akutagawa. “But it’s nice and refreshing, isn’t it?” She has the kind of charisma that comes from a wide lipstick smile and intensely focused eyes. Akutagawa has been teaching tea ceremony and kimono classes at Zenshuji since 1986. 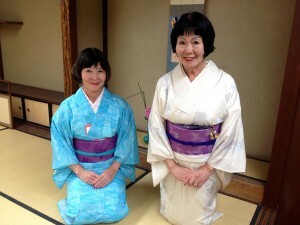 Before that, she taught corporate kimono classes in Tokyo, where she was born and raised. We switch between Japanese and English as she tells me the story behind each object that comes into the tatami room. One chawan, painted in concentric circles of indigo, green, and red, comes from Turkey. A marble one, in the variegated pinks and apricots of rose quartz, comes from Egypt. 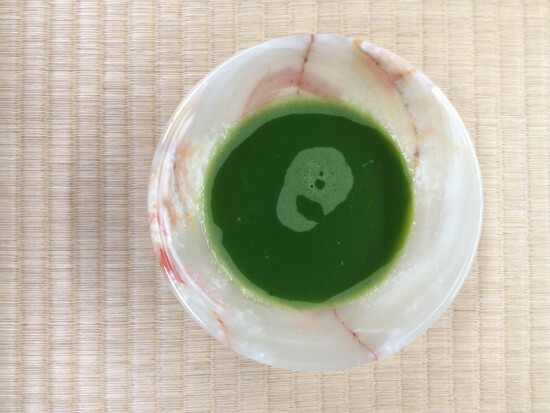 The French crystal pitcher, the Kyoto matcha, even the Toraya yokan has a traceable origin that Akutagawa is proud to tell me. In this humble multipurpose room, with the usual accumulations of clutter in the corners, she has created a place where students—about half of them from Japan, half from the U.S.—can be among beautiful things. The ceremony itself takes about an hour and a half among the four of us, including small talk and two rounds of tea. Lynn does the serving today, a role that rotates among students. After four years of classes, she knows how to enter the tatami room (feet sweeping slowly across the floor to avoid tripping and spilling tea), how to pour the water (one scoop of the bamboo hishaku at a time), and when to serve herself (last, of course). She looks at Akutagawa and Hosobuchi now and then for confirmation, which they always give with a smile. Though we’re practicing a highly ritualized art form, in this class and on this day, it’s nothing too formal or intimidating. When we walk out the door of the classroom, the heat will hit us in waves: first in the shade, then in the sun, then in the ovens of our cars, where we’ll flinch at the touch of our steering wheels. As we sweat, waiting for our air-conditioning to kick in, we’ll remember that cold tea, and the cool clink of ice against crystal. 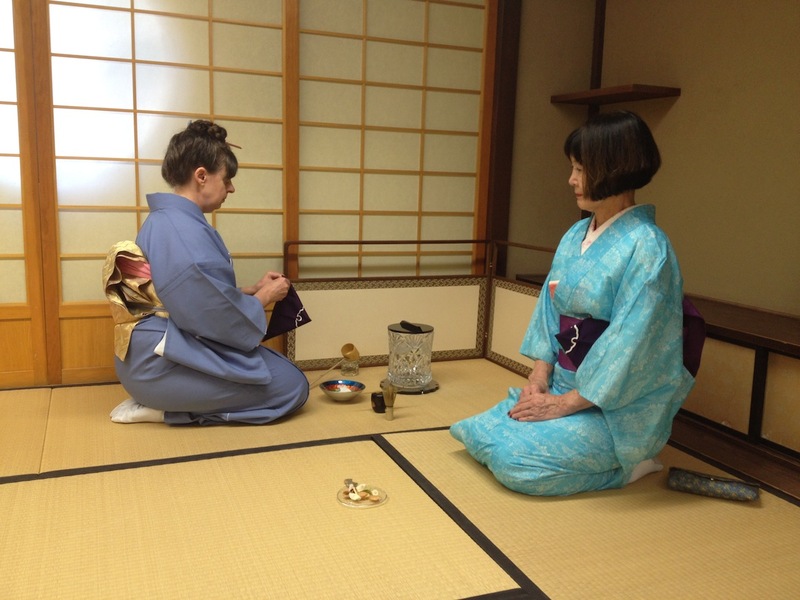 Fumi Akutagawa’s kimono and tea ceremony classes are on summer break for the month of August. They will begin again in September. The class meets on Tuesdays at 1 p.m. and cost $80 per month for four classes, plus a one-time $50 registration fee. For more information, contact Akutagawa Sensei by phone at (805) 529-0139 or by email. Mia Nakaji Monnier is The Rafu Shimpo’s online editor. You can reach her on Twitter or by email.